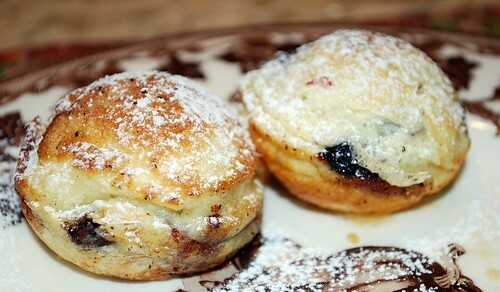 So: Ebelskiver. Say it with me: “able-skeever” – yes! These delightful little pastries are actually spherical Danish pancakes that have a filling in the middle. 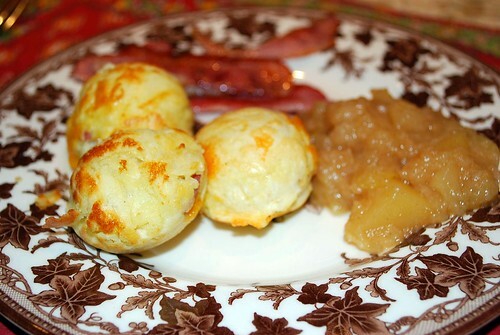 Ebelskiver means “apple slices” in Danish, and you will sometimes see it spelled “aebelskiver.” As you might have guessed, apples are one of the traditional fillings that you will find inside an ebelskiver. This sweet-or-savory combination made them perfect for dinner on fat tuesday. 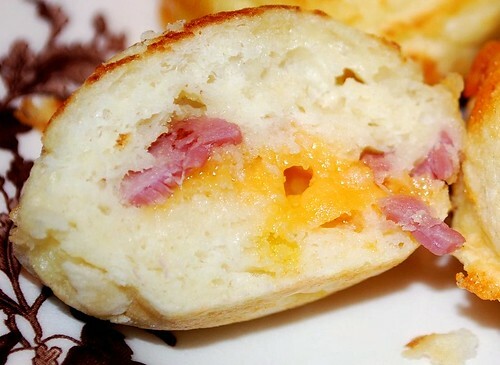 We always have a traditional meal of pancakes for dinner on Mardi Gras, and what could be better than savory filled pancakes for dinner with sweet filled pancakes for dessert??? In a bowl, whisk together the flour, baking soda, baking powder, granulated sugar and salt. In a small bowl, lightly whisk together the egg yolks and buttermilk. Whisk the yolk mixture into the flour mixture until well combined; the batter will be lumpy. In another bowl, using an electric mixer fitted with the whisk attachment, beat the egg whites on high speed until stiff but not dry peaks form, 2 to 3 minutes. 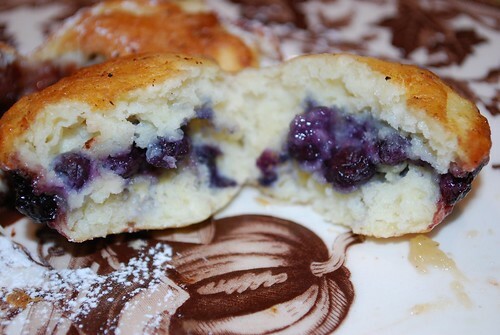 Using a rubber spatula, gently fold the whites into the batter in two additions. 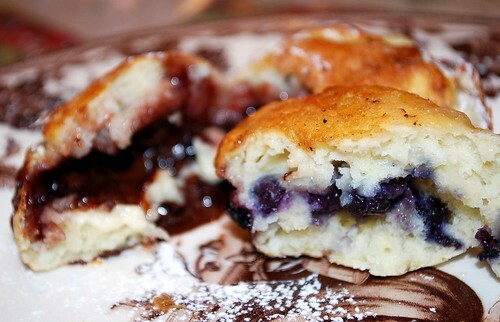 Put 1/2 of a teaspoon butter in each well of a filled-pancake pan. Place over medium heat and heat until the butter begins to bubble. 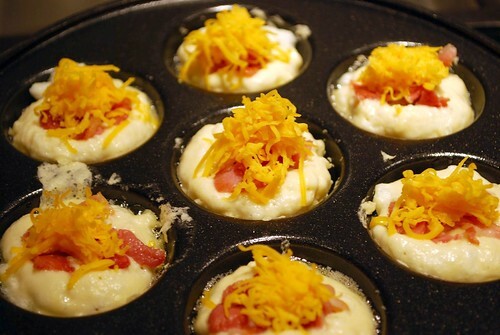 Pour one tablespoon of batter into each well and cook until the bottoms are golden brown and crispy, 3 to 5 minutes. 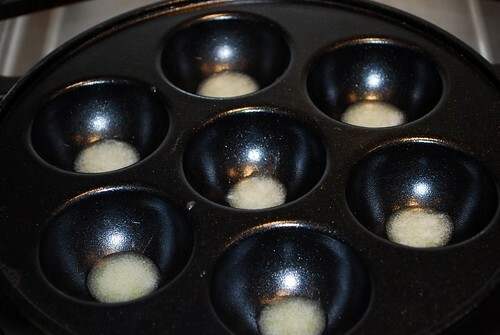 Gently add your desired filling on top of each puff. Next, top each filling with one more tablespoon batter. Using 2 wooden skewers, flip the pancakes over and cook until golden and crispy, about 3 minutes more. Transfer to a plate. Repeat with the remaining batter and fillings. 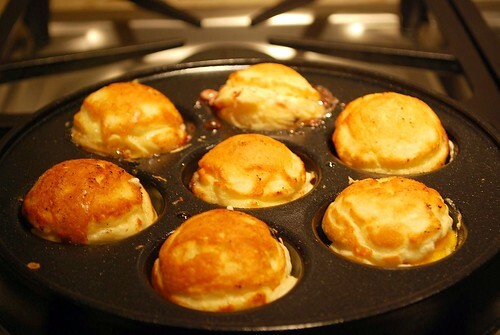 Serve your savory ebelskivers with whatever side you like – we had extra bacon on the side and some homemade stewed applesauce. 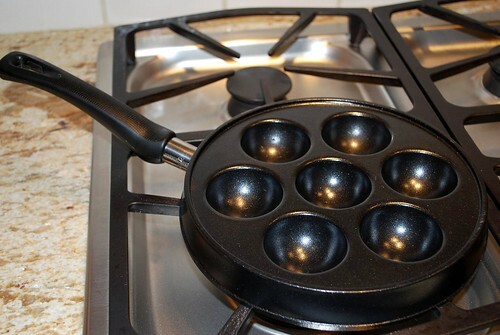 Dust your sweet ebelskivers with confectioners’ sugar and serve warm with maple syrup.